According to research, people suffering from psoriasis can effectively manage their unpleasant condition by eating a gluten free diet. This diet has attracted a lot of attention in the last few years owing to its effectiveness not only in the management of the aforementioned condition but also many other health situations as well. Gluten free psoriasis treatment helps is the management of the symptoms but this is mostly if gluten is a source of trouble for you as a patient. This has been hailed as a major step in the direction especially noting that psoriasis has no known cure. Food containing gluten including grains is known to worsen psoriasis symptoms. It is therefore important to check on the labeling of different grains if you are allergic to gluten in order to avoid such as a way of psoriasis management. This first success story epitomizes the true reasons why every psoriasis sufferer should eliminate gluten from their diet even if just for a test period. I do not think I could have worded the advice any better. 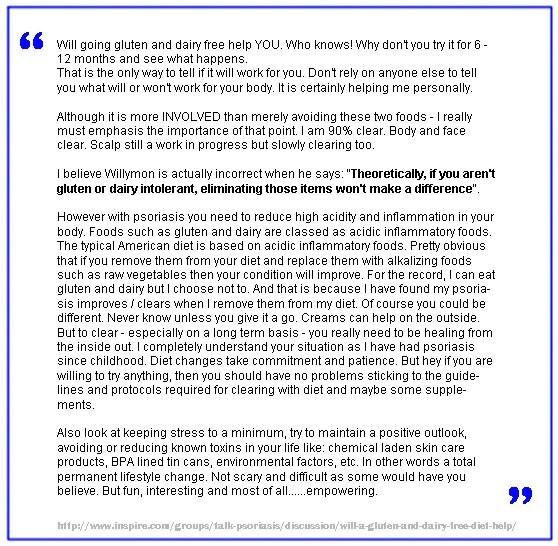 The following story is from someone managing psoriasis condition and who has tried eating gluten free diet. Though this is combined with other things, the diet seems to be working well in relieving his/her sufferings. The following story shows the dedication of a psoriasis patient who has religiously given him/herself totally to the gluten free psoriasis treatment. The results according to him/her are already evident and this could come as a major encouragement to other patients who are not sure whether it could work or not. In addition to the above comments, this following story shows how a psoriasis patient experience some remarkable results within a period of one month after starting on a gluten free diet. Her sacrifice was not in vain and as she put away her favorite drink and meals, her health changed drastically for the better. This has not only helped improve her situation but also save her money she would spend on psoriasis symptom management drugs. In the following success story knowledge is power and for this success story below, the patient has invested his time and energy acquiring this in a bid to sort out the psoriasis bedeviling him. He is has found out that healthy eating does actually alleviate this condition. The consumption of gluten and gluten offshoots makes psoriasis symptoms worse (the severity depends on the level of intolerance the person suffers from). The patient below tried using several drugs and creams such as the one he has mentioned but this was not very effective in eliminating the condition although it gave some relief. The gluten free diet did the trick and he is now happy that his skin has been restored. Two weeks was the time it took for this patient to be free of psoriasis following a gluten free diet. She had also tried other remedies including shampoos and drugs but this did not help much. This success story is quite inspiring from this patient who has had psoriasis for four long years. She eventually tried a gluten free diet and from her testimony this is what did the trick and her condition improved. This comment was posted by a lady whose daughter has been suffering from psoriasis for several years. The use of gluten free diets didn’t seem to work thus requiring additional remedies. This comment below is yet another case of a negative comment about a gluten free treatment of psoriasis. The patient also has another condition which necessitates home to eat gluten free foods. This comment below depicts a patient who has yet to see any benefits of a gluten free diet. She is also in the meantime trying other remedies but she still retains some hope that GF may just work for her with time. There is quick transit time from eating food to eliminating waste, therefore less time for toxins to escape from your colon, into your bloodstream and out through your skin. I give gluten free diet as a form of psoriasis treatment an effectiveness score of 8/10. Please note that by combining gluten free diet with other treatments on the Top 25 natural psoriasis treatment list you can effectively control your psoriasis for life. From the aforementioned testimonies, the improvements in psoriasis vary from one individual to the next depending on several factors. The extent of psoriasis damage to the skin is key to the timing. The quality of diet is also instrumental in resolving the condition. For some of the patients it took just two weeks for other it took up to a year to see results. The more gluten free diet one took, the shorter the length of time to resolve the issue. IS IT WORTH INVESTING TIME AND MONEY IN A GLUTEN FREE PSORIASIS TREATMENT? Without a shadow of a doubt the answer is an absolute must for every psoriasis sufferer. Before you start, you must plan out your food diary for the upcoming week, buy all you need in one big shop. My quick tip is to make big gluten free dinners and save the extra helpings for your work lunch the next day. This means all you have to worry about is breakfast and dinner options when trying to complete your shopping list.